When my book The Devil’s Concubine came out from IDW in 2011 I was obviously super excited. Having a book out in the US was a decade-long dream of mine and now it was finally happening! All fired up from going to Comic Con and doing signings in San Francisco and LA, I could not wait to present the follow-up to my editor. STILETTO was/is in my mind a much better book, more weighty in subject matter and more solid in the artwork. I really poured my heart and soul into it. And they turned it down. You hear a lot about “breaking in” to the US comics scene. Well, I thought I was in and it turned out it was a revolving door! In the years after I always carried a copy of the Danish graphic novel (a beautiful hardcover edition) with me everywhere I went. I’ve shown it to editors at restaurants, in bars and at shows both in the US, Canada, France and Germany – never finding a home for it. Frustrating when you know you have a great book and for whatever reason no publisher picks it up. I really want people to be able to read STILETTO, regardless of their nationality. And guess what? TODAY YOU CAN!!!! 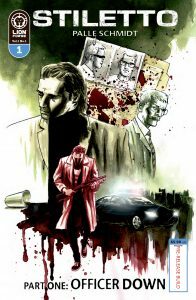 STILETTO issue #1: Officer Down is out today from Lion Forge and you should be able to order it through your local comics store. Palle Schmidt is one of those visionary writer/artist combos you rarely see… His artistry and storytelling pull you into an intricate underworld that engulfs the senses and blurs the line between reality and fiction, making you feel like you’re there on a ride-along with our detectives as they desperately search for a cop-killer. Stiletto weaves a thrilling mystery that flips the entire crime genre on its head and keeps you guessing until the pulse-pounding conclusion. Thanks for letting me tell (part) of this story. Hope you’ll give STILETTO a chance too.